I have a friend that I enjoy meeting for lunch or coffee, who has a unique and inspiring world view that always helps me take a new perspective. About a year ago, over a lunchtime beer (for him, not me), we were talking over the effects on my life of my brain cancer diagnosis, which I’d received about six months prior. I was expressing that I was struggling to work through feelings of anger and being cheated of something. I know, intellectually, that I have not been promised anything by anyone in this life, and that the question really isn’t “Why me?”, but rather “Why not me?”. That said, it turns out that I need to work on learning the difference between intellectual knowledge and gut feeling. This experience has been the first in my life where what I knew to be true, logically, didn’t seem to be able to overrule my emotional responses. And even though I would have said, in a cerebral sense, that I understood “anything can happen to anyone”, emotionally I still couldn’t let go of the idea that I’m a winner. I’m good at things. I’m smart. I accomplish goals. I’ve made mistakes, but I always come out on top. I’m not one of those people who always has things going wrong, or who are always down about something. Assimilating this new information in my life is difficult. I was telling my friend, let’s call him John, that I feel like suddenly the world is polarized for me, and everything now is “before and after” and “us and them”. The problem for me is that I don’t feel that I’m in the right half of those binary constructs. If you’re talking about a joyous milestone, the idea of “before and after” is lovely and is the stuff of stories told to your children and grandchildren. The idea of “us and them” is often comforting, it’s how we identify who and what we are, by knowing what we are not. I fight with these concepts instead being skewed for me. Now, everything before my doctor phoned is rosier than everything after. And “us” is the people who have to go to the cancer treatment center, and “them” are the people who don’t know where the front door is. I’ve thought a lot about that. At first I wondered if I was supposed to be glad to have this opportunity to live without that same effervescent vesicle between me and reality. Maybe the bubble is oppressive, and stifling… Maybe I should be fighting to be thankful that the scales have been taken from my eyes and I can see life for how fragile it is. If that is where I should be going, however, I must honestly confess I’m not there yet. Sure, I can admit that I value many of the “little things” more now than I used to. But if I had the choice to have my bubble back, I think I’d jump at it. So I don’t want to offer trite sentiments about being grateful to be aware of how precious each day is. Rather, I just think it would be lovely if people could see their bubbles, and value them for what they are. 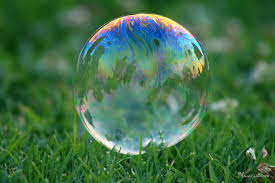 If your bubble is security in health and family, and living in a community and a country of freedom and prosperity, if your bubble is the comfort of knowing you are loved, even if your bubble is the warmth of ignorance, I’m not here to burst it. But you should see it. Know that it’s real, that not everyone has this. Don’t rush through your days and never consider it. Befriend your bubble. Be grateful for it; it doesn’t have to define or limit you. Look through it, see beyond it, make it work for you as a lens to see the world and your place in it. I’m experimenting with manufacturing a bubble. The right kind of bubble. I’m blowing my bubble like a kid practicing with my first wad of gum, building it up and expanding it breath by breath. I think it can be done. Powerful stuff here Alix – thanks for sharing! You are a lovely writer. Keep going.